When you think of a gala do certain activities come to mind? Maybe you think fancy venue, expensive dinner, listening to people speak about the cause, and maybe even an auction. You might also think of having one or two open (also called hosted) bars for your guests to drink all night. I personally think of dry chicken, boring speakers, and waiting patiently for an appropriate time to go home. For most of us, the idea of a gala come with certain expectations. This is because most galas you’ve heard of are pretty similar. There can be a lot of pressure to feel like if you host a gala, it also has to be expensive and that your organization has to go all out to create an impressive atmosphere. Otherwise, you’ll look cheap and like you don’t care about the people you’re asking for money, right? This can be a very slippery slope. Especially if your nonprofit is fairly new or you haven’t hosted any events before. This usually translates to spending more money than you have on all the wrong things. Turning away from the false belief that galas are the only fundraising event worth having takes away the pressure to spend more money than you’re comfortable with. The great part is that this forces you to be more creative with your event ideas and get really clear on what your tribe would show up for. get clear who your event goals, who ideal guests are and how to plan an event they'll love! We won't send you spam because we don't like it either. Feel free to unsubscribe at any time. How well do you really know your people? Can you list 10 of your supporters by name? Do you know off the top of your head what they do and what they like most about you? Before you have any kind of event it’s SO important that you know who your people are. I can’t stress this enough. My point is that planning any event that your people just aren’t that into is a HUGE waste of money. I mean, big time. Might as well just put your money in a box, throw it in the ocean, and wave as it floats away. That’s totally true, and it warms my heart that you’ve been paying attention. You definitely have to do some testing to figure out what works best for you and your tribe. Every group is special and while what works for someone else might also work well for you too, don’t get stuck thinking that there’s a “one size fits all” situation for a successful fundraiser. Getting to know your tribe means you can make much better guesses. Why start out shooting in the dark when you don’t have to? Increase your odds of success by listening to your people. By doing this you might find that your folks want a different kind of event all together. If your tribe is made up of outdoor enthusiasts, why make them sit in a ballroom for 3 to 5 hours? Instead, give them an experience they’ll think is amazing because it already fits their interests. By creating the event that your guests love you can build better relationships with them and save yourself money and hassle by only investing in the things they want. Not sure what kind of event to have? Here are 20 ideas to get you started. Let’s be real, I have yet to come across an organization that doesn’t have anything else going on while they plan a fundraiser. There’s always other programs to run, grants to write, and special projects to get off the ground. Galas are quite the production- large events like this take a long time to plan. When you think of the kind of event you want to host, think about all of the other bazillion projects you have going on (again, ignore my math), your budget, and what your people would like to go to. While some people manage to scrape a large event together in 3 months (I’ve done it and I don’t recommend it! ), or maybe 6, most successful galas and other banquet events take a year of planning. Why? Because that’s the amount of time it takes to build relationships. If you’re just starting out you have to give yourself enough time to find out who your potential supporters are and build up your connection to the point where they know who you are, like what you do, and trust how you do it before you make an ask. If you’re a bit more advanced in your fundraising, you’ll still need more time to ask for large sponsorships (I think of “large sponsorships” as asks of $10,000 or more). For a lot of corporate or foundation sponsors, you have to make sure that you get your ask application in on time to meet their unique deadlines. Galas also require more planning ahead for things like booking a venue. The types of venues that work well for a standard gala fill up pretty quickly. In most major cities there are only a handful of places that can hold hundreds of people for a sit down dinner, so you can expect to book your venue 9 months to a year in advance. Being more creative about your event gives you the freedom to look for cool, interesting places to host your event that might not be a good fit for the typical gala, but would be perfect to try something new. Along with taking a ton of time, galas (or any large event with more than 200 guests) take a small army of people to pull off on event day. Whether it be hiring catering teams, recruiting volunteers, bringing on an event planner, or all of the above, you’ll need more people than you might think. So many people make the mistake of spreading themselves too thin by wanting to have a big gala right off the bat. Their event becomes this huge beast to feed and they’re so busy trying to keep everything moving that it’s hard to show people how they shine. Keep in mind that it also takes time to find and train your volunteers. Not everyone has the personality and/or skills that are a good fit for events. Trust me on this one, I’ve seen some things that make my eye twitch! A perk of choosing an event that isn’t a large gala is that they usually take less people to put on successfully. By being creative about your event you can easily make sure your event showcases the strengths of your team. You want to be sure that you put your best people in the right positions for them to win. Whew! We just went through some major reasons why your event doesn’t have to be a gala. 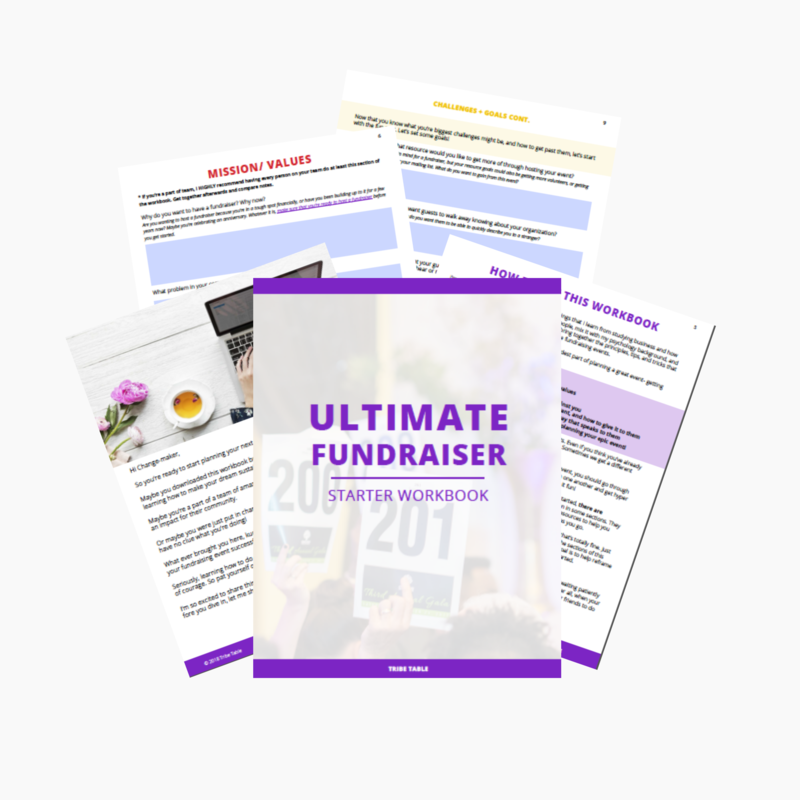 In fact, check out this FREE list of fundraising event ideas to get you started! WANT MORE IDEAS FOR YOUR EVENT? grab this FREE list of 60 theme ideas + start planning the perfect event that your guests will love! We won't send you spam because we don't like it either. Feel free to unsubscribe at any time. Notice that all of the things listed are usually seen as weaknesses or excuses (not enough money, not enough people, no reliable team, etc.). These are some of the biggest fears that either push people into thinking they have to have a big event because they’re desperate, or worse, keep people from trying fundraising events at all. Don’t be so afraid that you stay on the sidelines. And don’t fall into the trap of thinking that there’s only one way to be successful. Break free from all the noise. Choose an event that you can realistically handle without the loss of sleep and sanity. After all, if you’re investing time, money, and people power, why not do something that’s fun for your and your guests? I’d love to hear what ideas you have for your next event! Leave a comment below and tell me all about it.